Have you ever wanted to create a time-lapse video of a drive through a scenic area, or a jaunt down a speedy highway at night? It’s actually pretty easy. With a smartphone and about $ 25, you can create your own time-lapse driving videos. The first thing you’re going to need is a smartphone, obviously. For our purposes, we used an iPhone, which already has time-lapse capabilities built into it. Those of you using Android, you may or may not have such powers by default. But if you check out the Play Store, you’ll find quite a few apps (like the very popular LapseIt or the rather powerful FrameLapse) that will do the job. Regardless of what kind of smartphone you use, you’re going to need something with which to hold it while you drive. 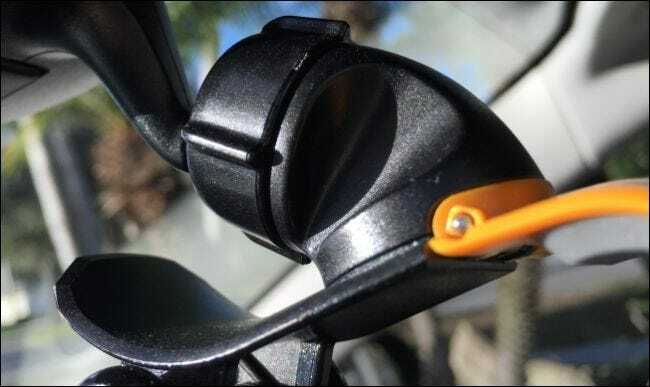 You can use either a dash or window mount, but you need to make sure you buy something that holds the smartphone still and steady. 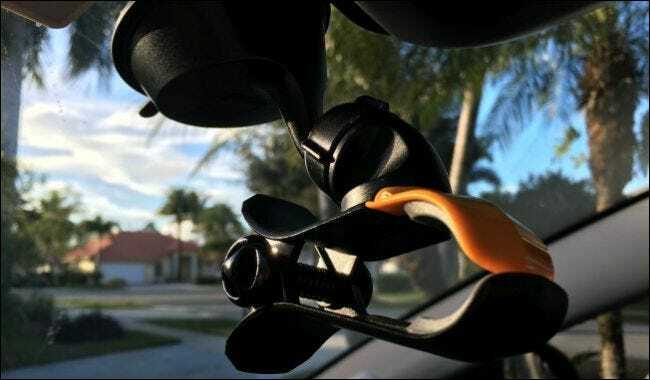 We used this phone mount, which retails on Amazon for around $ 25, but you’re free to shop around and find something else. We liked this particular model because of the way it holds the phone, allowing us to get a clear, unobstructed view of the road ahead. We elected to affix it to the windshield, reasoning that it wouldn’t then get in the way on the dashboard. Plus, it hides inconspicuously out of the way when we’re not using it, but doesn’t block our view of the road when we mount the phone. Our smartphone mount can hold any device up to six inches wide and remains neatly out of sight when we’re not using it. Additionally, this particular mount is smartphone-agnostic, which means that we’re not limited to the iPhone. It’ll work with any phone that can fit within its clamp. Next, you absolutely need to make sure you have a USB car charger. Your car may already come equipped with one or several, or you may need to buy one. 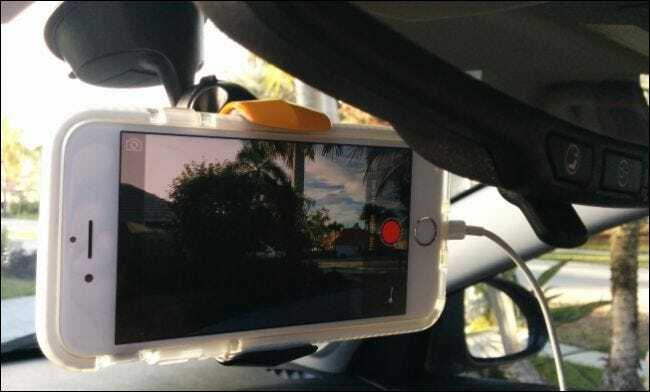 No matter the case, you have to be able to keep the phone plugged in because the screen will stay on the entire time you’re filming, which will quickly drain the battery if you’re going on a longer drive. Plugging your phone in, especially for long trips, is an absolute must if you want to film it all. Next, get your smartphone situated before you begin your drive. This means plugging it in, aiming it, and making sure that you’ve either loaded your time-lapse app or have turned the built-in time-lapse mode, if your phone has one. Make sure to aim the camera and plug the phone in before you leave the driveway. If you need to make adjustments later on, be sure you’re parked (not rolling) when you do. Finally, make sure that the mount is tight and isn’t going to move during the drive. In the case of our mount, we can tighten the whole thing so it doesn’t shift from the inevitable shakes and rattles while we roll. Make any adjustments and tighten things down before you head out so the camera doesn’t move (or moves minimally) during your drive. At this point, you should be ready to start but before you do, let’s talk about some things you should know before you put the car into Drive (or 1st gear for you manual transmission lovers). The temptation to mediate your drive by looking through at your smartphone’s screen will be great, but we need to impress upon you: DON’T. As much as your eye may wander to the screen, make sure you’re actually looking through the windshield and checking your mirrors, and paying attention to your surroundings, as you would on any other drive. Also, no matter how much you try, your smartphone may shift while diving. Do not try to make adjustments to it unless you’re parked somewhere safely. You can always edit goofs and errors out. You cannot, however, edit out a serious accident as a result of being distracted. Finally, you won’t be able to use your smartphone for anything else because it will otherwise be engaged in filming your drive. This means that (at least in the case of the iPhone) you won’t be able to listen to Pandora or make phone calls because the camera co-opts the microphone, and while time-lapse won’t have any sound to it, you still won’t be able to use the phone for anything other than making your movie. Beyond these basic warnings, you should be good to go. This is a really easy process and while you may not get perfect results the first few times you try it, practice makes perfect. We recommend taking the time to do a few test videos before you commit to the real deal. That way you know what to expect, where to ideally aim the camera, and how much it shifts while moving (and possibly then how to mitigate the problem). When everything is set up, it’s time to start the camera and roll out of your driveway. Keep in mind: the longer you film a time-lapse movie, at least in the case of an iPhone, the more frames it will edit out. To that end, we highly recommend you read our article on how to take time-lapse videos on an iPhone or iPad. The rest, as in where you go and what you film, is completely up to you. If you make a particularly awesome video, be sure to share it in our discussion forum below!